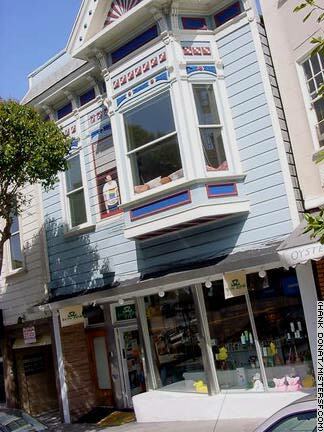 The 1984 Academy Award winning documentary The Times of Harvey Milk tells the story of a revolution that rose on Castro Street from this location, #575, the '70s camera store of Harvey Milk. Milk's rise as the City's first openly gay Supervisor is recounted here, as is Milk's murder with Mayor George Mosconi at the hands of disgruntled pol, Dan White. Harvey Milk promoted many progressive ideals, but his primary message was about coming out. His calls to "Come out, come out wherever you are," and his unflinching manner in successfully campaigning against the anti-gay Briggs Initiative in 1978 are hallmarks of his career. Appealing to San Franciscans of all stripes because he was fun, the charismatic Milk spearheaded the pooper scooper law and was famously filmed stepping in it. Power, politics, humor, devastation, rage and injustice - all extremes that swirled around San Francisco during times that changed the City's destiny as surely as any earthquake. Because he is rightly considered a martyr of the gay rights movement, many members of the gay community and other San Franciscans, consider his to be guiding principals. A familiar refrain among longtime members of the gay community is "What would Harvey think about...?" (Milk's successor on the Board of Supervisors, Harry Britt, thinks Milk would like "Will & Grace.") Britt was appointed by Mayor Dianne Feinstein and was later reelected three times. Britt served 14 years in all. Gays and lesbians have been represented on the board without interruption since the time Milk was elected. The famous 'lavender sweep" came in 1990, when gay teacher and comedian Tom Ammiano was elected to the Board of Education the same year lesbians Robert Achtenberg and Carole Migden were elected to the Board of Supervisors. Donna Hitchens, also a lesbian, was elected Superior Court Judge, rounding out the sweep. Of these, Ammiano has ascended as the President of the Board of Supervisors who won the battle but lost the war to unseat Mayor Willie Brown. Achtenberg was in the Clinton administration. Migden is in turnaround, having been elected to the State Board of Equalization in November, 2002 after a stellar career in the State Assembly. Many political opportunities - including a possible run for Mayor of San Francisco in 2003 - lie ahead for Migden.